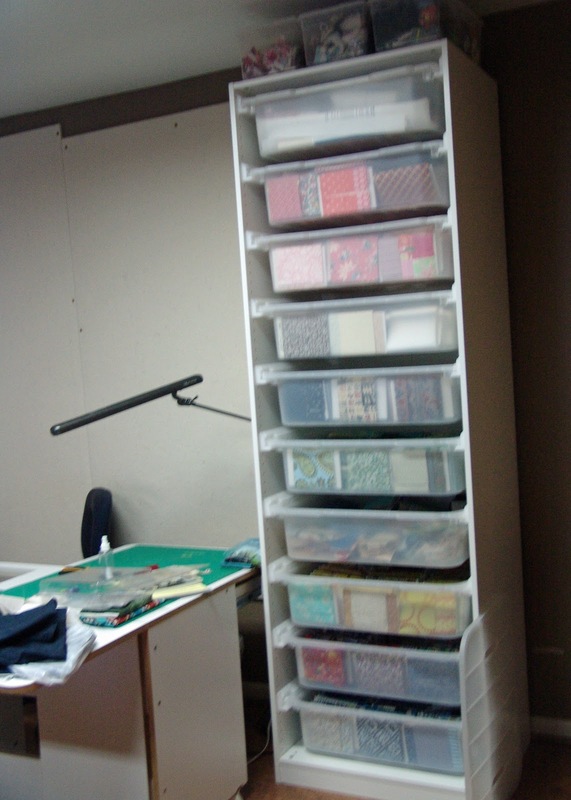 My new fabric storage solution. 29.5 inches wide by 90 inches tall. UPDATE: since this post, I have grown my stash to three! I decided to get the shorter ones so I could reach the top easier. 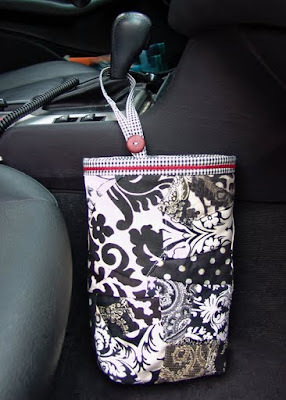 here I store all my interfacing and Pellon! They have three different widths of cabinets and two different heights. I picked the 29.5 inches width but they go up to 39.5 inches wide. Doors are an option if you put two together. I opted to not put doors on to increase my ease of access. There are also lights you can install and the attach to the wall for safety. I have been very busy and sorry for not posting much lately! What have I been doing? I have been working on a new storage solution for my quilting fabric! 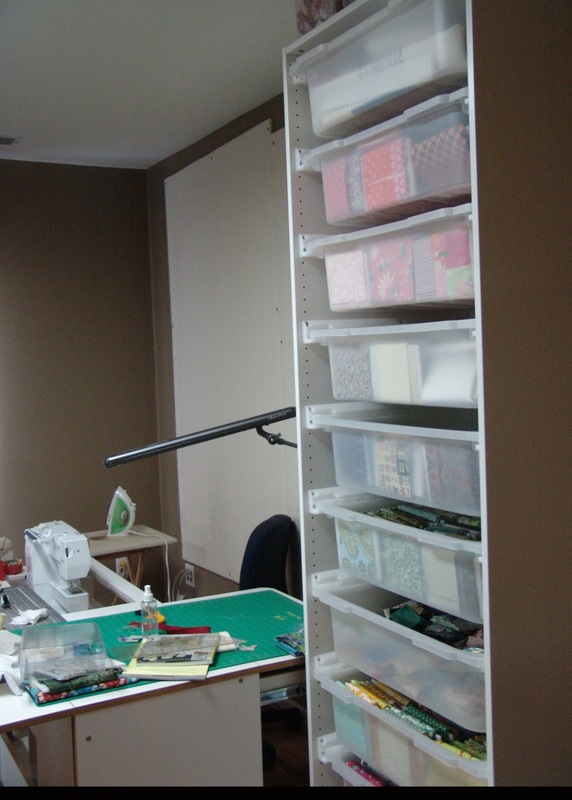 I decided to store my quilting fabric on small boards. My boards are handmade by me by cutting white foam core board into 5 inches by 7.5 inches rectanges and pinning fabric onto the board. 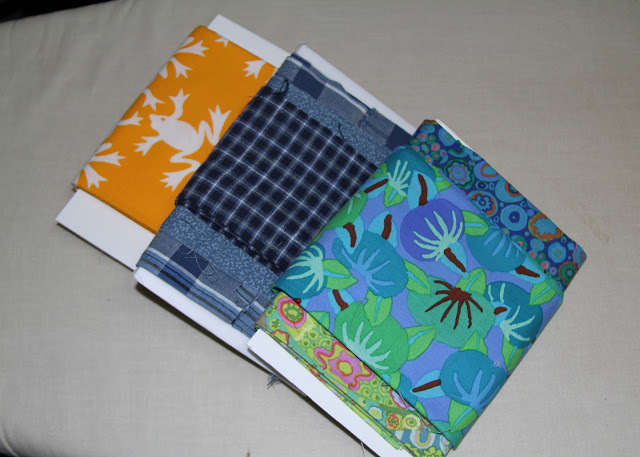 I put anywhere from one to three different fabrics on each board depending on how much yardage there is for each. 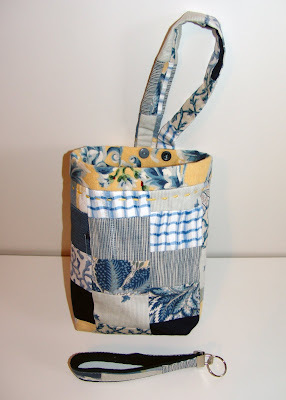 I can put 4 fat quarters on one board or 3 yards of one fabric by itself. When searching on the web, I saw many quilters placing their fabric on store bought boards but that was too expensive for me. 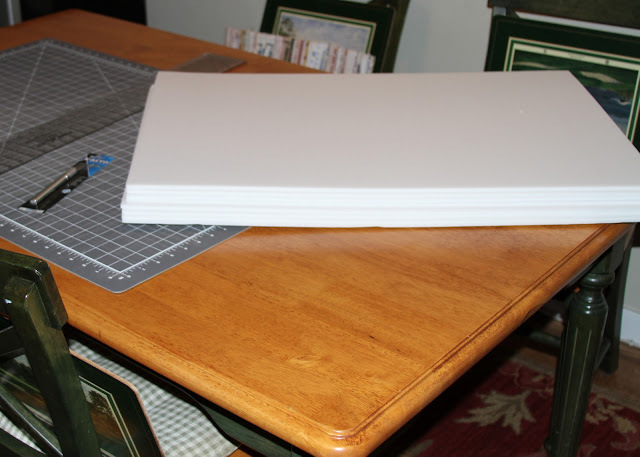 I was able to buy 50 sheets of white foam core board (link here) for only $117.50 at ULINE online OR 25 sheets (minimum purchase) for $63.75. 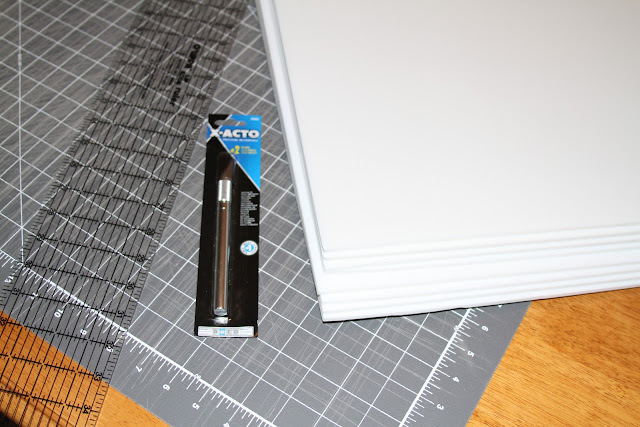 In my opinion, it's better than the foam core board you buy in the craft store because they have a heavier paper covering, making them more difficult to cut. I discovered this because the first sheets I bought in the craft store were difficult to cut because of the paper on them plus 2 sheets for $9.99 (50 sheets for $250) was way too expensive, I might have just bought one made by the vendors at the quilt shows. I did an online search for a discount price and found them at bulk. I was pleasantly surprised the ones in bulk were much easier to cut! This system worked for me because I could fit three rows of boards in these bing from IKEA. Many bloggers show their fabric on boards like this but they display them on shelves. I didn't want to expose my fabric to the dust and sunlight that most have to deal with when placing their fabric on shelves out in the open in their sewing room. I wanted a more protected, yet easy access storage solution and this is what I came up with after much searching! I love how the drawers can be completely removed to allow me a great view of my entire collection. I can see all the fabric at once. 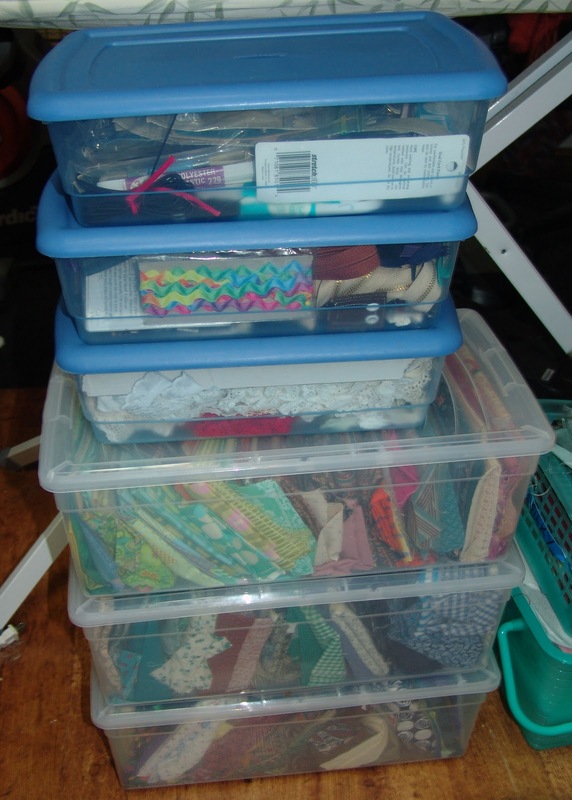 In my past fabric storage drawers, the back part of the bin could not be visualized easily. My folded stash always sat ontop of each other making it difficult to see my stash. This way I see it all!!!! The lid sits on top and it is easy to lift off to enter. No locking mechanism on these lids. 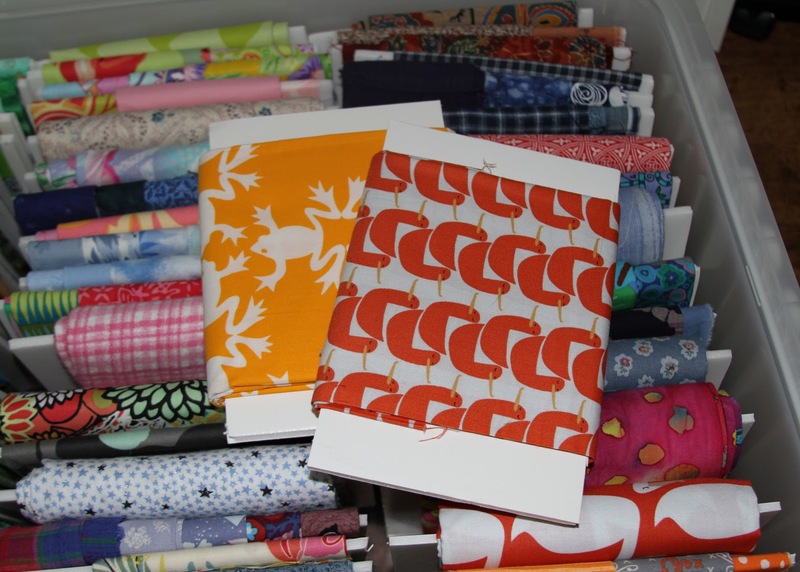 This drawer has over 70 fat quarters and some yardage stored in it! 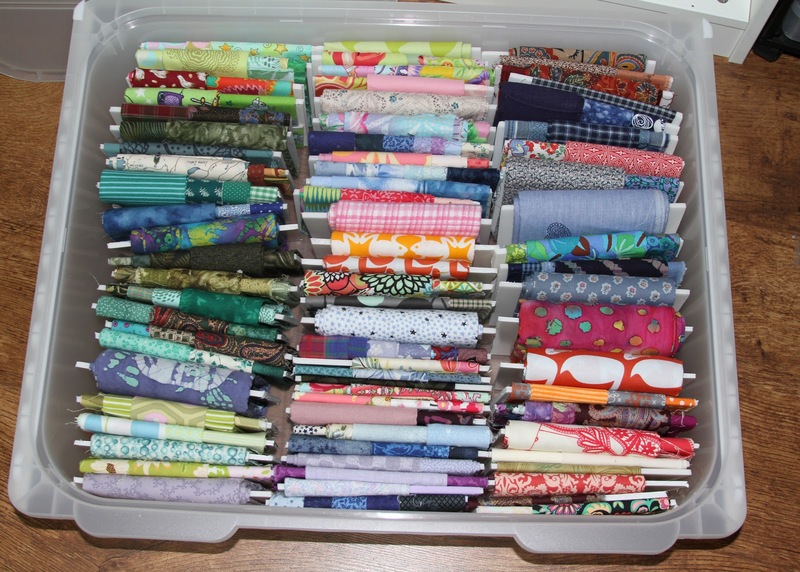 There are 10 drawers, so that's 700 fat quarters plus! Below is just a small taste of the fabric I inherited from my mom when she passed away in July. I had to make 5 trips in my car! 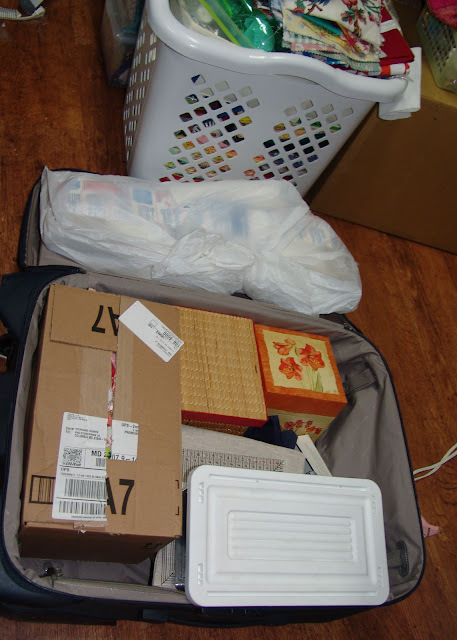 Thus, I had to come up with a way to store all this stuff and give away stuff I just couldn't imagine using. (link here) cut into 5" x 7.5" rectangles. EACH white foam board I cut into 16 rectangles. See above information about the boards. Lots of ironing and folding the fabric onto the boards and then pinning. I ironed them to fit onto the board. Here I have 3 different fabrics on this board which saves space in my drawers. I put similar colors on them and made sure I could see each one. They overlap each other. You needs lots of pins! 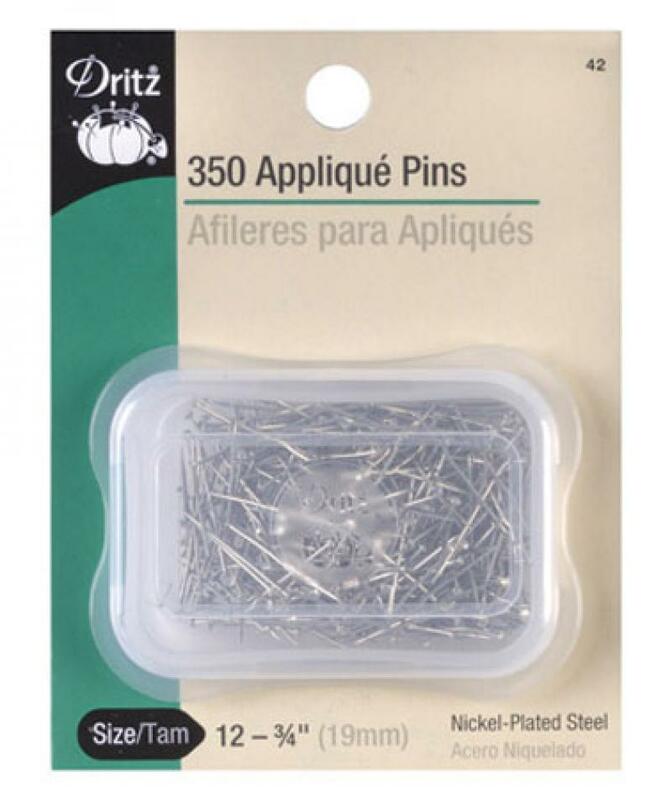 I have used 6 (350 in each) containers of applique pins! 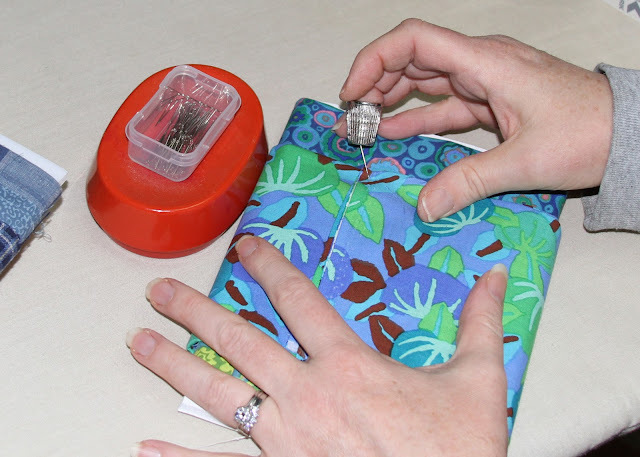 Pinning the fabric with small applique pins works great! 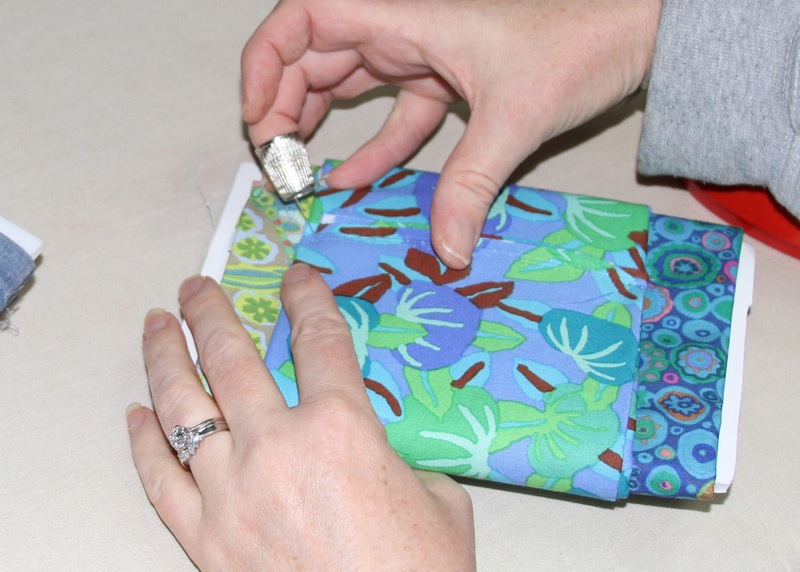 I pin at an angle directly through the fabric end into the board. Use a thimble to save your fingers! You need to stab the pins into the board making sure the pins are at an angle and don't go through to the other side. I sometimes have to redo them until I got the pins just right. I just LOVE how I can keep a lid on top to keep the dust out! One is not enough, so off to the store next week to buy a second entire unit. I hope to decorate my room next so keep posted for more pictures once I get my space looking good! I moved around all my furniture to make it fit. My design wall is now behind my sewing machine. In the top of the drawer I put things I don't use as often, interfacings and pellons. I have a step stool nearby. The IKEA PAX system with let you put many different types of drawers in them. 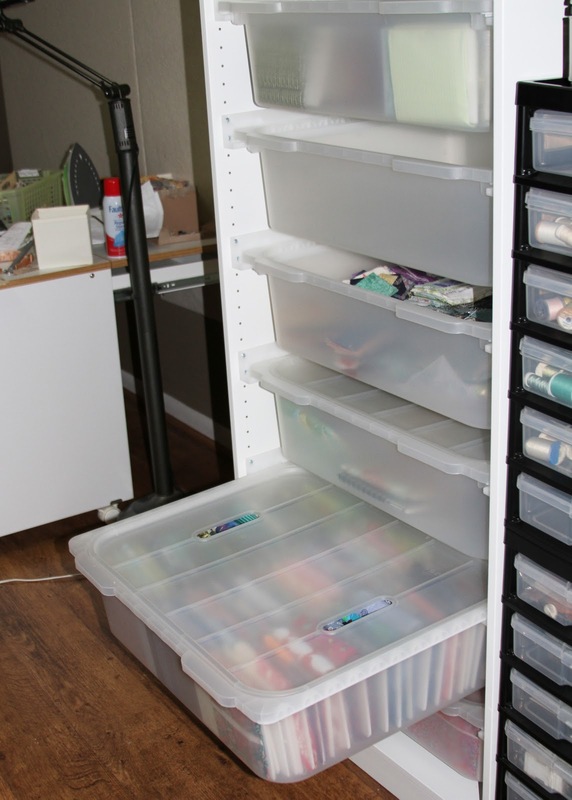 I chose the plastic bins but they metal drawers, wood drawers, shoe racks and much more. This is just my system I designed. 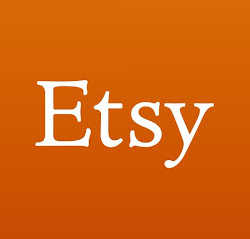 You can go to their website listed above and design it they way you want it. Thanks IKEA! Love my storage unit. Since the post in 2011, Ikea no longer makes the exact style drawer as shown in my pictures. 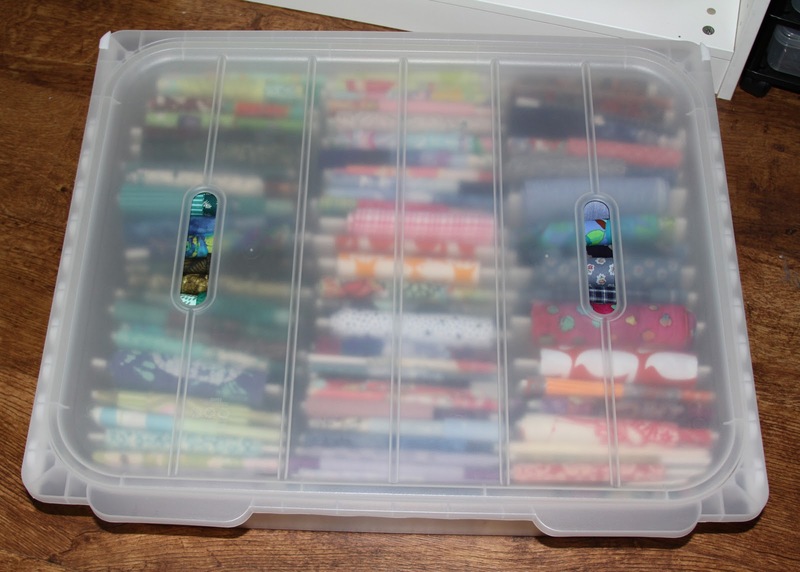 They still make some great drawers to use for fabric or your sewing room. 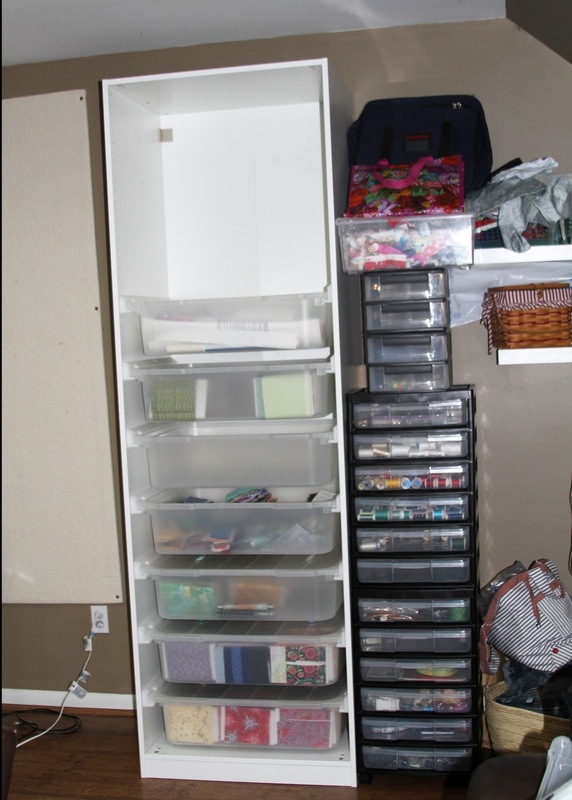 You can organize the inside with many types of interior organizers with the KOMPLEMENT series. It looks like they don't carry lids for the fabric anymore so maybe you would want to add a door to keep the dust out of your fabric? 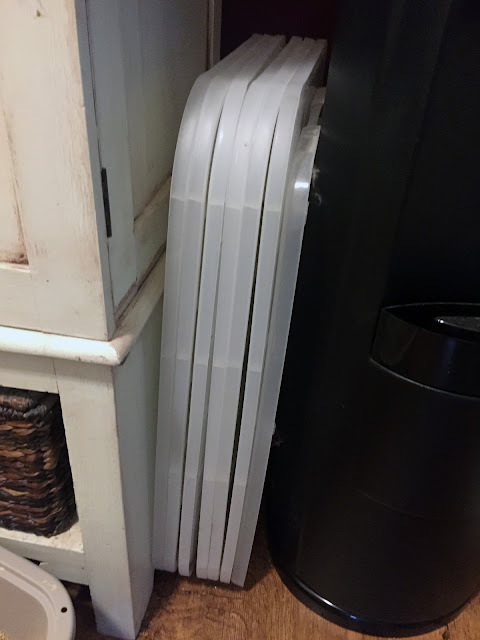 I use my bins so much, the lids stay off more than on. I have a pile of them under the table not even in use. These KOMPLEMENT drawers have multiple widths, make sure you get the width of the PAX wardrobe frame you selected. They make several different styles, some with glass fronts, some mesh and this one solid wood. Pick what works best for what you want to use them for. Adding doors to the front is an option too but I wanted easy access and because the room wasn't being used for anything but my sewing room, I left the doors off. If I were using the room for a guest bedroom as needed, I may add doors to the wardrobes. Hope that helps everyone. Shoot me any information you find that is different! Thanks for the info on your storage solutions. 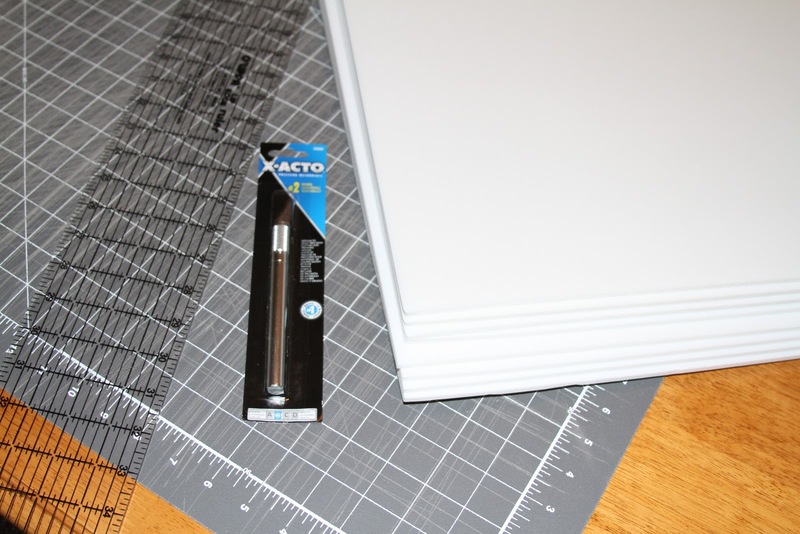 About the foam board, What's on the surface? The close-up looks like there are three layers. What a GREAT system you have there, Steph! Merry Christmas to you and the family and many blessings for all of you in 2012. WOW..... what a great storage solution! Now, can you please send Kevin (with truck) over here for a day so he can make a trip to Ikea with me??? :-) Oh, and as the drawers were probably flat packed, please ask him to bring his screwdrivers and whatever other tools he may need to assemble the thing! Seriously, great idea and one I hope to replicate if I can find the same thing at our Ikea. Love your storage system. 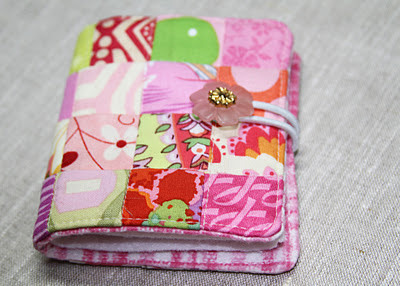 Quilters can never have enough. I enjoy your blog. come by and visit me anytime. That is AWESOME! 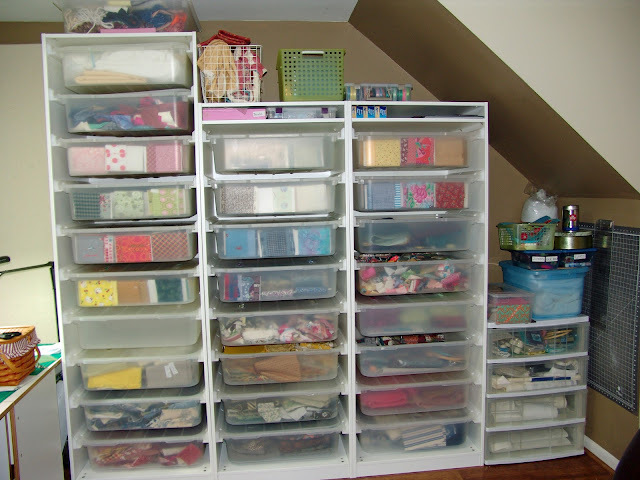 You did such a wonderful job of storing those precious fabrics in a way that is neat but accessible at the same time. Yay for you! Great solution! I like how you can see everything at once and how accessible it is. Thanks for sharing. Hello from Northern Germany, dear Stephanie! 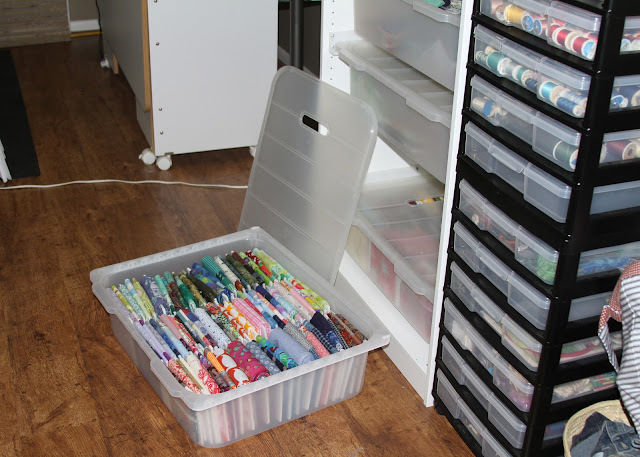 I love your fabric storage wonder! After showing it to my husband, he spontanously decided to rebuild this for my new sewing room. Just one question: the drawers are not an origin interior of the PAX collection,because I can't find them on the internet? Did you use TROFAST drawers? I would be so thankful if you could answer me, because we want to go to IKEA on saturday. Thanks to everyone for the nice comments. I have responded to each and every question privately via email but since there is a lot of discussion about the fact that IKEA no longer makes these drawers, I wanted to update everyone with the information I have found to be helpful, still allowing you to use this system. See above for more details. Any more questions, just add a comment and I will respond. Thanks! Stephanie. I tried to go to the link for the foam core board and there is no foam core board. Not sure if it’s the link or what. It looks to be janitorial supplies now. Help! I have got to do something with this mess of a closet and organize my fabric better. (I probably just need to get rid of some)�� thank you! Thanks to Mona's comment above, I was made aware that the link to the foam core board was bad. I have added a link to a new source for it. Hope that helps everyone!